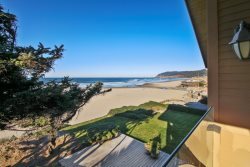 If you would like to enjoy Cannon Beach like a local then Logan Cottage is the place for you. This charming one level home is warm and inviting, nestled into the midtown neighborhood of Cannon Beach and conveniently only a few short blocks from Sleepy Monk Café! With a cheery bright green front door, the covered front patio is a peaceful spot to enjoy the quiet cul-de-sac neighborhood. Inside you’ll find a charming living room with enough space for everyone to get together and just relax after a day on the beach. There is a fully stocked eat in kitchen with plenty of space to make meals. Next to the kitchen is a complete laundry room with a back door to the yard. The yard is private, fenced on three sides, for when you need a quiet spot to read a good book, or just have a glass of wine. The master bedroom to the left of the living room features a king bed with a vanity area as well as an attached full bath. Off to the right of the living room is the second full bath and two additional bedrooms, both with queen beds. The real surprise at Logan Cottage is the large family room that is off the third bedroom. Originally the garage, this family room with soft blue paint has plenty of space for everyone to enjoy the flat screen TV while lounging on the comfy couches or the twin daybed. It’s the perfect hang out place after a long day of beachcombing, shopping, hiking, and or anything else. If you’re looking to vacation like a local than Logan Cottage is the place for you.